Experiencing pain in the bottom of the heel is surprisingly common and is one of the number one reasons why people seek out expert medical advice. 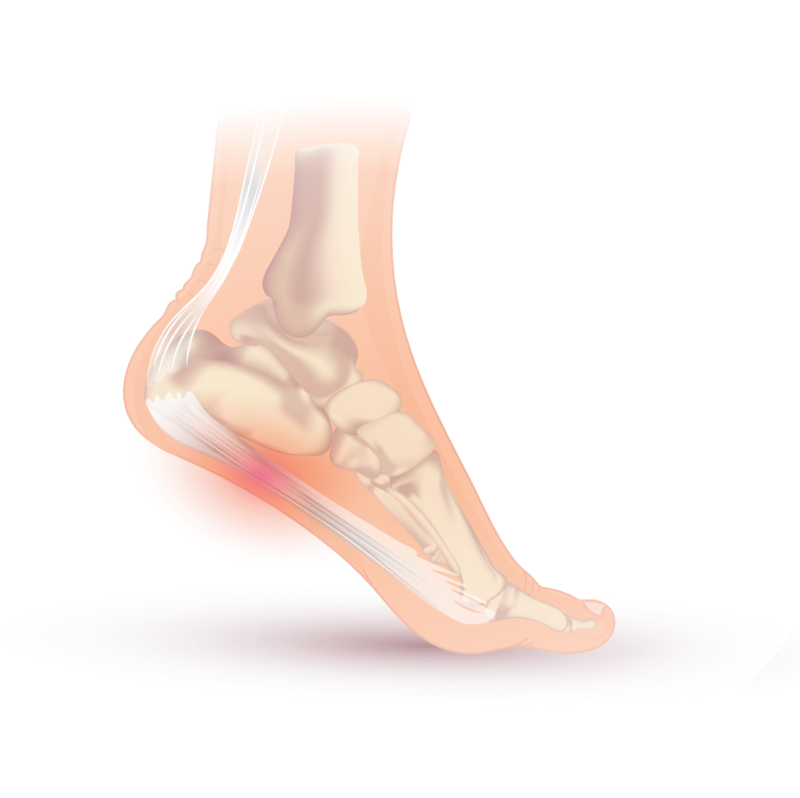 This type of pain is often referred to as ‘bone spurs’ or ‘heel spurs’ because of the small bumps of extra bone (‘spurs’) that often form on or under the heel bone which show up in the X-rays of many patients. For a long time, doctors thought that these extra bumps of bone were the main cause of foot and heel pain, but we now know that the real cause of most types of pain in the heel and under the foot is actually a condition called plantar fasciitis. Essentially, it occurs when the plantar fascia, a strong band of connective tissue that runs under the arch of the foot, becomes irritated and inflamed. The best treatment for inflammation of the arch tendon (plantar fascia) is physical exercise – but not just any form. While some activities such as running will worsen the condition, specially designed exercises can help you to regain your full range of foot motion and increase your stability (the arch tendon is responsible for absorbing shocks, but also for keeping the foot curve stable). Moreover, the right kinds of physical exercise can also help you strengthen local muscles and maintain flexibility, thereby helping to prevent the onset of similar problems in the future. What kinds of exercises are recommended for plantar fasciitis? Healing the inflammation is the ultimate objective for anyone diagnosed with plantar fasciitis (or bone/heel spurs). A good exercise plan therefore needs to consider all the necessary elements required for effective recovery and rehabilitation training. It is simply not enough to focus on just one type of exercise (e.g. strengthening exercises) as this will slow down recovery and limit your rehabilitation. In short, a good exercise plan must contain the following types of exercises to be effective: movement exercises, stability exercises, strengthening exercises, and stretching exercises. Physical exercise isn't just physical exercise. Be safe and rehabilitate with a well-structured training program! The Injurymap app offers users a complete and balanced training program designed to aid those suffering from plantar fasciitis (heel spurs) to make a full recovery. Developed by experts to automatically structure and balance all the different forms of exercises needed, it is easy and safe to use. You can download it here. We picked four exercises from the Injurymap app, one from each of the four exercise categories, that can help you treat and reduce your foot pain. During the acute period, most people typically suffer from inflammation, pain and sometimes experience reduced movement in the foot. If you have been diagnosed with plantar fasciitis, then your initial objective will be to regain your normal range of mobility. The best way to achieve this is to perform movement exercises. Injurymap is designed to start you off with easy and simple movement exercises but then gradually increase the difficulty levels as your condition improves, thereby increasing your flexibility and helping you to progress in tandem with the exercise plan. The next objective in the recovery program is to improve your balance via stability exercises. Again, Injurymap will increase the difficulty of these exercises, helping you to regain control over various movements incrementally, until you begin to notice an improvement in your overall balance and stability. Strong muscles provide added support to a damaged plantar fascia, which often needs time to recover. As you progress through Injurymap’s program of strengthening exercises, you will find it easier to return to everyday activities (both work or personal). These forms of exercise are meant to tone your muscles, after you have regained your physiological range of motion and stability. They will also help to reduce your risk of future injuries to a minimum. Last, but not least, you need to perform stretching exercises. These will keep you flexible, thereby reducing the potential impact of each movement or activity on the damaged tissue. Stretching exercises play a significant role in the overall exercise plan, as they help to facilitate the healing process.